Kevin Johnson (1) defended by DaQuan Brooks (23). 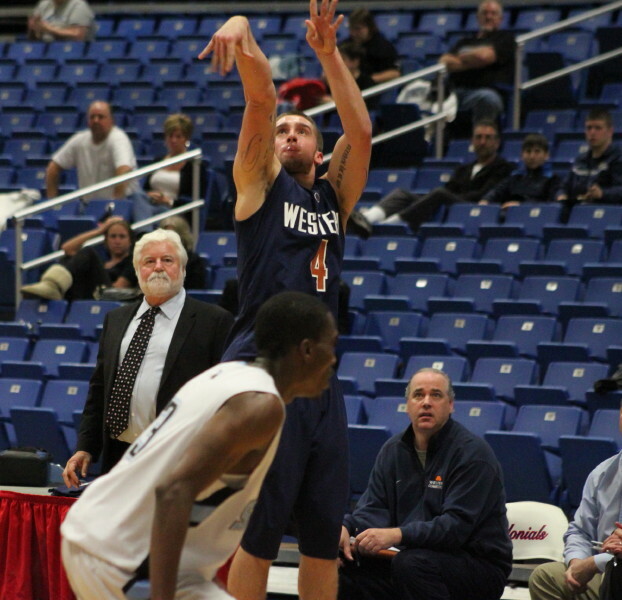 (Danbury) Western Connecticut State University defeated Richard Stockton College, 69-63, in the first game of the Hampton Inn Classic on Friday night at Feldman Arena. 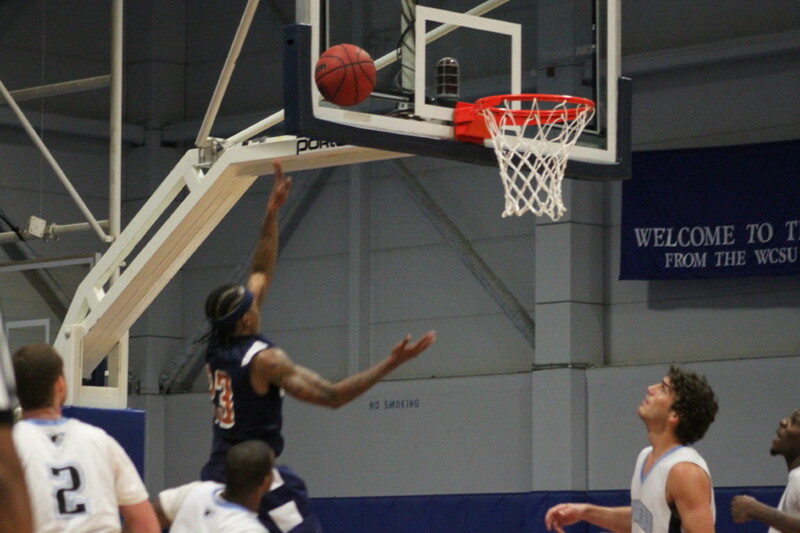 DaQuan Brooks (23) goes in for two of his twenty second-half points. 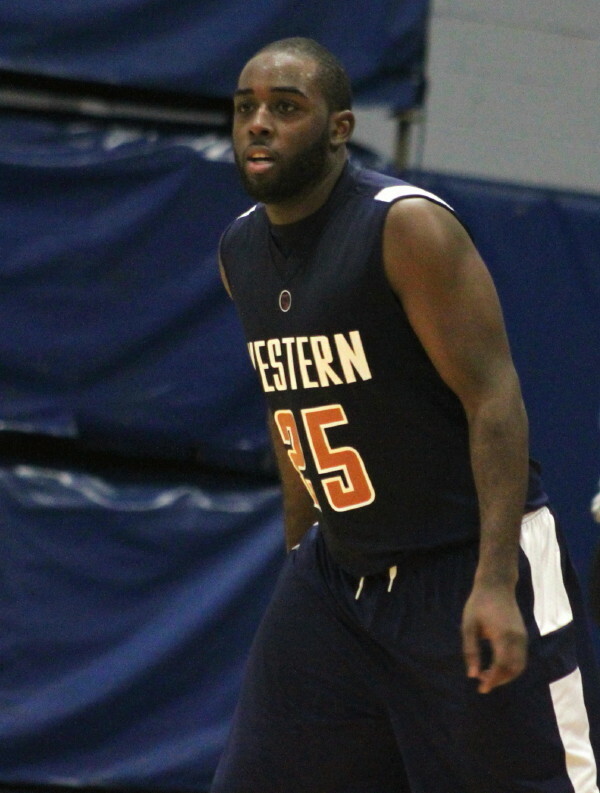 Senior DaQuan Brooks was the difference-maker for the Colonials of the Little East Conference down the stretch. The visitors from the NJAC (New Jersey Athletic Conference) trailed by as many as thirteen points (50-37) in the second half but closed the gap to, 58-57, with 4:11 to play. Enter DaQuan. 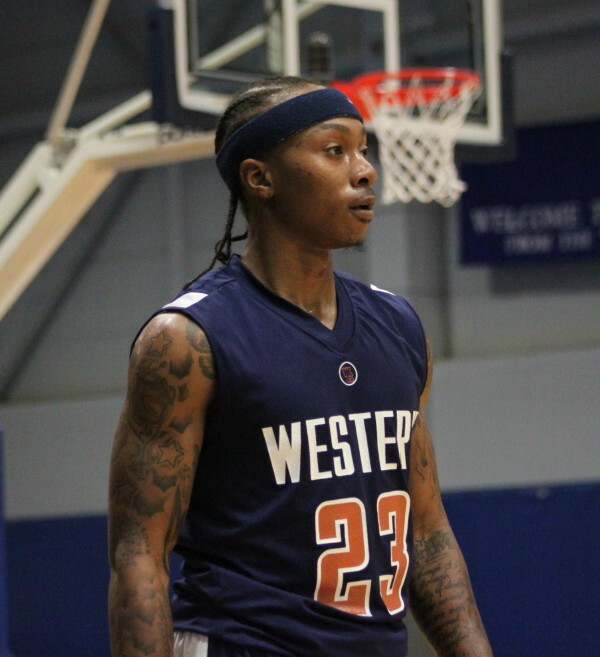 The talented 5-10 guard scored every point for WCSU the rest of the way. He also had a block and a rebound. Very impressive. 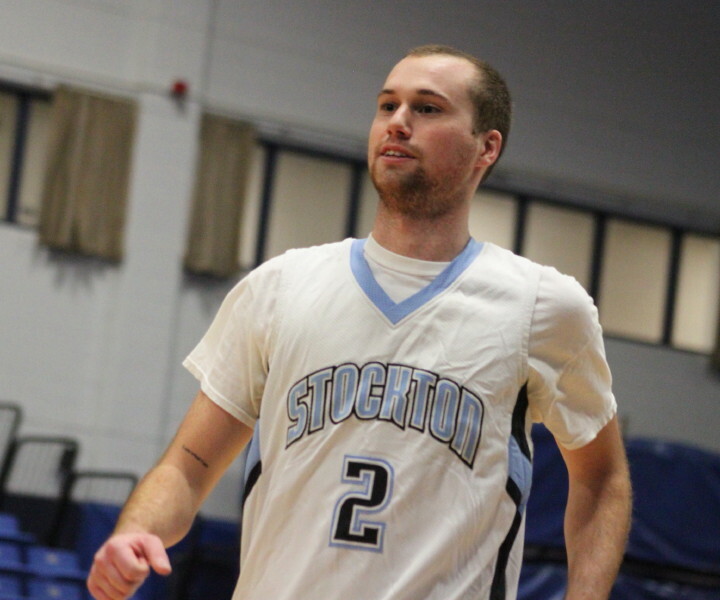 Stockton (1-4), despite traveling from Galloway (NJ) for the game, had the early lead (14-4) before the Colonials rode a couple of Ryan Pelletier 3’s to gain a, 24-21, advantage with 6:45 until halftime. The Colonials led, 34-31 at the half. Sophomore guard Kevin Johnson put up ten points in the Ospreys, 20-8, surge in the second half that brought them within one point. 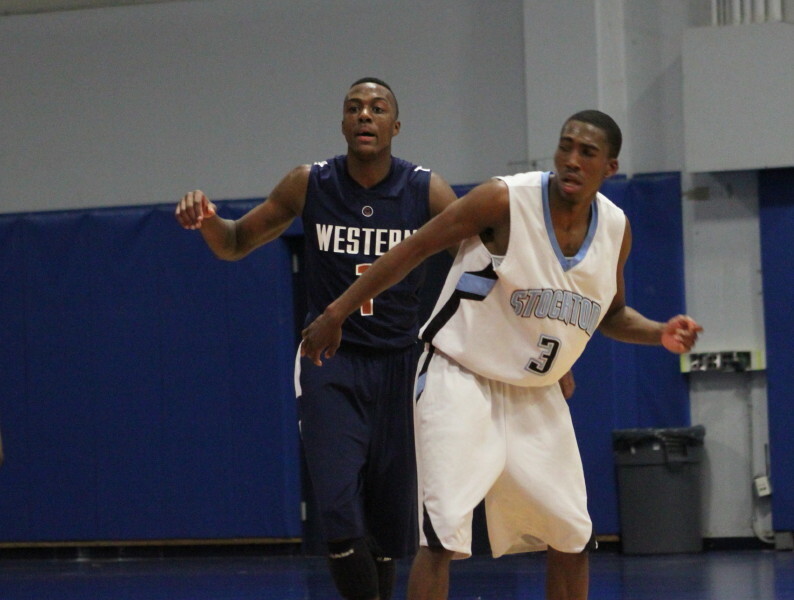 DaQuan (29 points) and Kevin (21 points) guarded each other throughout the game. I sensed that the game within the game was their head-to-head matchup. Both could get to the basket in a hurry and finish before any shot blockers arrived. 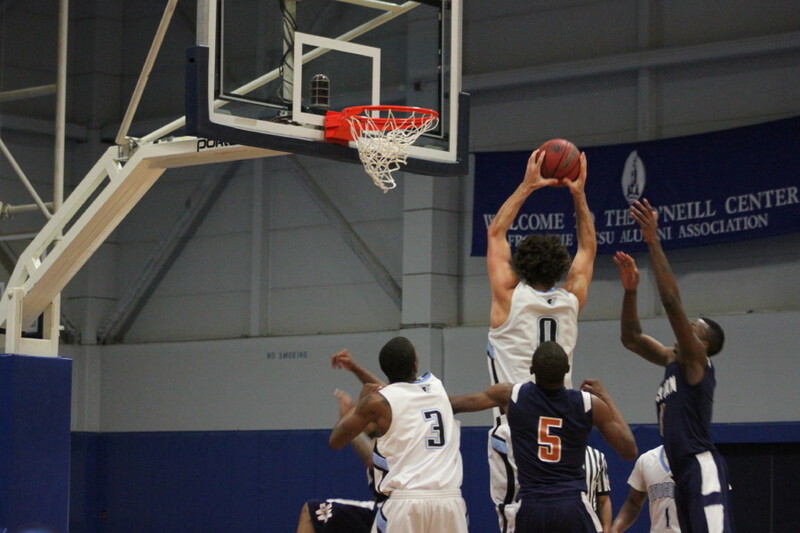 Bill McDonough (0) gets one of his nine rebounds. 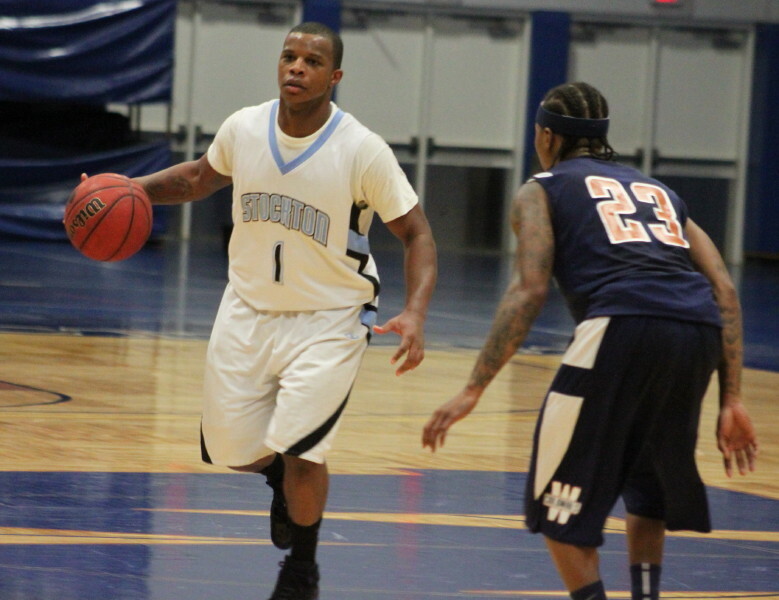 Kevin had seventeen points in the second half and three steals in the game. 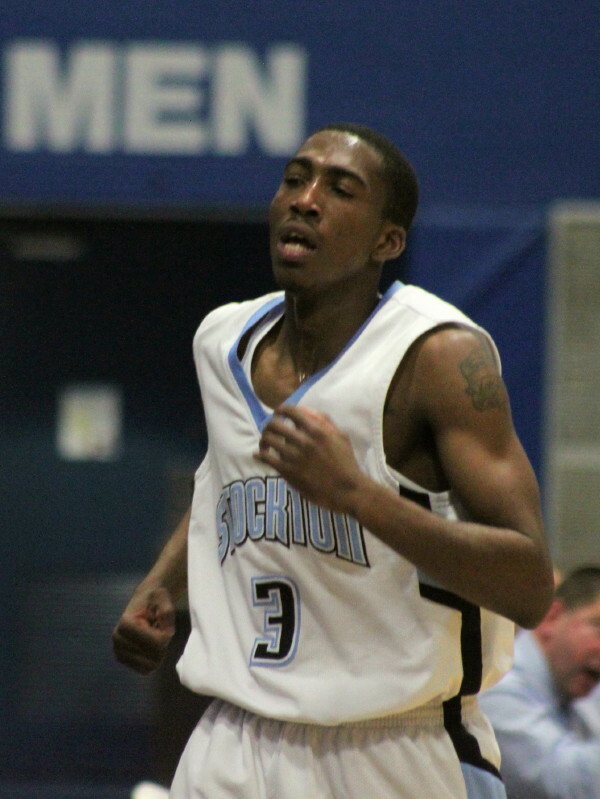 DaQuan had twenty points in the second half with six assists for the game. Talented twosome! The Colonials (3-1) will face Johnson & Wales on Sunday at home at 1PM. 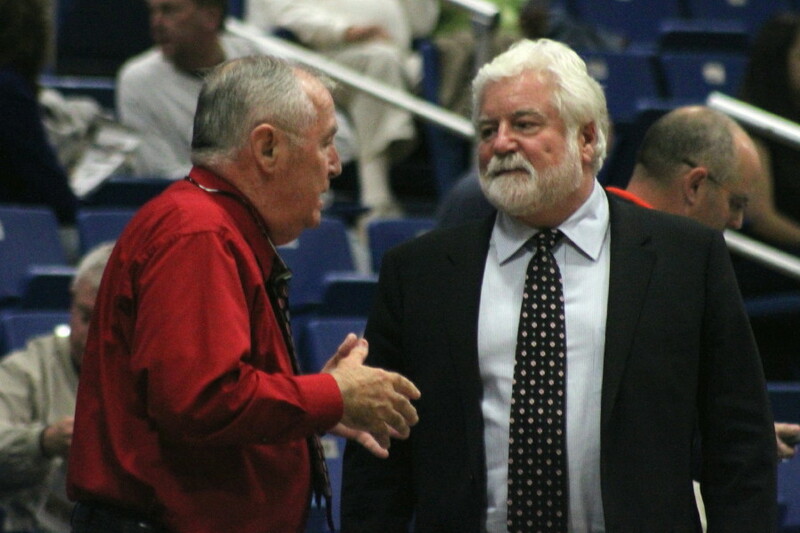 The Ospreys get J&W tomorrow at the Feldman Arena at 1PM. DiAndre Brown (15 points) had eleven of them in the first half. 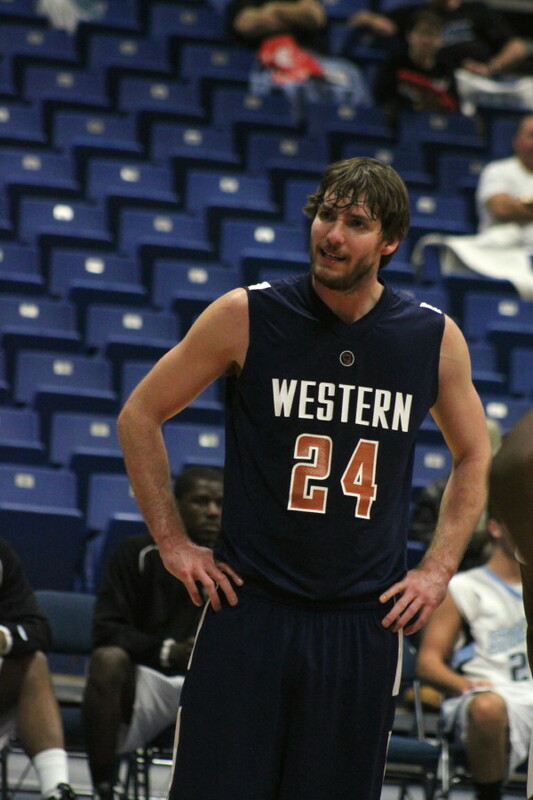 The Colonials did a lot better job of denying him the ball in the second half. 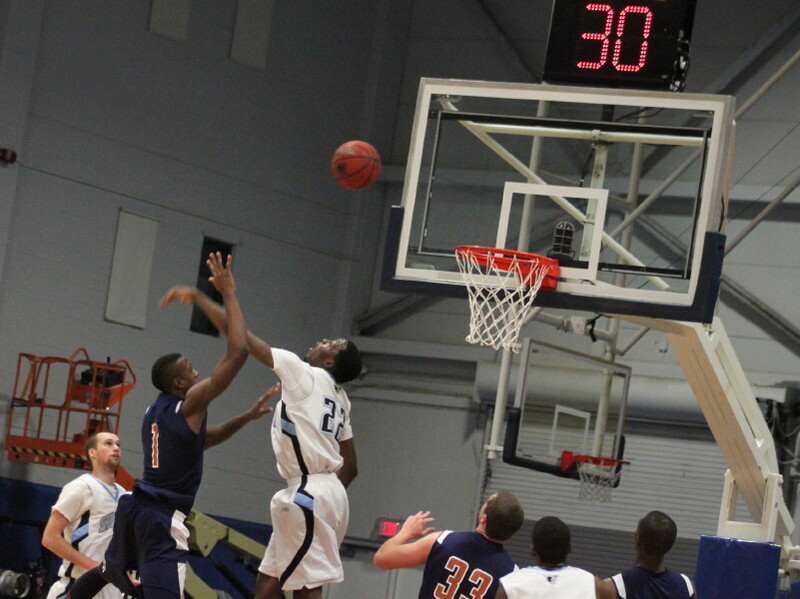 DiAndre Brown and Bill McDonough each had nine rebounds for the Ospreys. Mark Redding and Luis Bridtter did the same for the Colonials. The best physical matchup had 6-7 Bill McDonough going against 6-7 Gary Robinson. Gary’s defense had a lot to do with Bill’s 2-for-9 shooting for the game. In a game played the day after Thanksgiving you’d expect some post-turkey effects but nothing was obvious. Who was Richard Stockton? He was the first New Jersey delegate to sign the Declaration of Independence. The Feldman Arena has everything you would want – good lighting, comfortable seating, an excellent floor, and plenty of parking. My thanks to Colonials SID Scott Ames for supplying me with the stats I’m using for this entry. The pictures enlarge to normal size if you click on them. Salman Yusuff (22) goes for block. 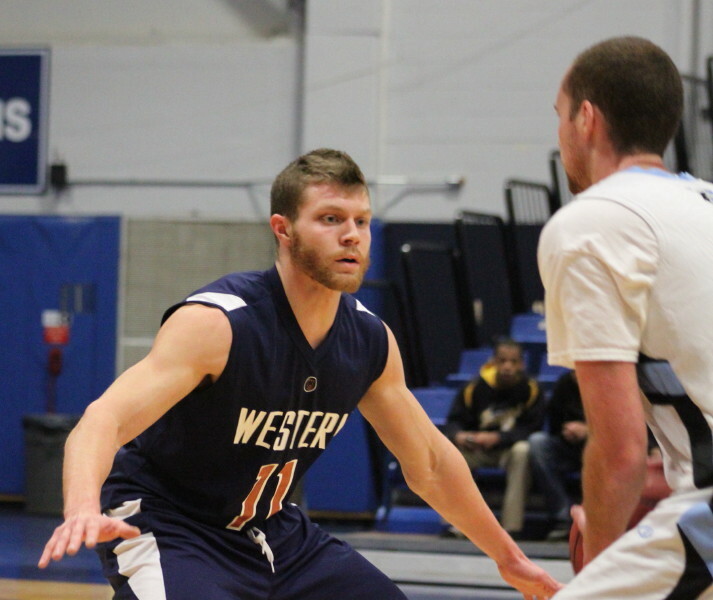 Ryan Pelletier (4) shoots as Western coach Bob Campbell (standing) watches.